About 25 years ago, as my views on the EU/EC/EEC were converging on a eurosceptic position after briefly thinking a single European currency was “obviously a good idea”, I picked up a copy of The Road to Serfdom by Friedrich Hayek, published in 1944. At the time, I was young, single and living in Oxford, which is a great place to immerse oneself in political and economic thought. It is fair to say the book was something of a revelation for me and I still have the same copy, covered in my original pencil marks. But one chapter was harder to digest, and that was the last one entitled “The Prospects of International Order”. Recall that the early 1990s was a time when the f-word — “federalism” — and its variants were everywhere in the EU/EEC debate and had become eurosceptic short-hand for the EU’s ambitions for statehood — the “United States of Europe”. Yet Hayek’s chapter was talking about international federation in apparently glowing and “classical liberal” terms. As I picked through the chapter, it gradually dawned on me that Hayek was not referring to what the EU actually was or intended to become but was instead about a very liberal (in the classical British sense) minimal state arrangement. Once that particular penny had dropped, it was necessary to read the entire chapter all over again. It then made much more sense but also proved to be good preparation for another Hayek essay, “The Economic Conditions for Interstate Federalism”, which was the last chapter (why again the last chapter?) in his book “Individualism and Economic Order”. The key point from Hayek’s works is that he saw international federation as a mechanism for limiting the power of government as well as, or particularly as, a structure to prevent conflict. Specifically, he saw such a federal structure as having the effect of stopping the germination of nationalist and necessarily protectionist policies in one particular country but — and this is the crucial bit — of those policies not being taken up to the federal level. In other words, it served to prevent legislation at state level but did not then fill the “gap left” at the federal level. I would suggest that anyone surveying the European Union today will consider that acid test and see an organisation that fails it. And so to Dalibor Rohac’s book which is undoubtedly a serious and well referenced work that deserves proper consideration. Unfortunately this review is barely going to scratch the surface of it. For Rohac, a self-confessed one-time eurosceptic, Hayek’s writings formed a key part of his journey towards supporting the EU project. Hayek did not, however, represent the start of Rohac’s journey and that is arguably significant. What actually caused Rohac’s awakening was his personal connection to Eastern Europe and specifically how those countries viewed the EU as providing a glidepath from communist dictatorship to ‘civilisation’. And in particular he highlights the concept of the EU as a ‘commitment device’ — committing a country to ultimately beneficial policies that may have otherwise proven too politically difficult to introduce. He therefore moots that without the prospect of EU membership, the path of development in Eastern Europe — of coming in from the cold — would have been much less benign. By way of contrast, he notes the unhappy experience of non-EU Ukraine since the end of the Soviet Union. It is a case powerfully made, and for someone with such a personal connection to the region, it was clearly enough to shift his intuition from EU critic to EU supporter. “Today’s EU is far from being the free market ideal outlined in Hayek’s essay”. Rohac briefly comments on Ludwig von Mises (Hayek’s own inspiration in many ways), whose view of a European federation was more sceptical. Mises feared that a European federation may simply replace nationalistic chauvinism with a bigger and more damaging pan-European version directed against America and Asia. But after that passage, the narrative moves on to what Rohac calls a hubristic period for the EU around the turn of the 1990s with the Maastricht Treaty, the move from a European Community to a “European Union” and the euro, which Rohac claims was “born out of this hubris as a step towards Europe’s future political union”. In short, he is suggesting the EEC/EC was foolishly diverted by hubris, from a relatively sensible course up until this point into full-on integration. Economic and Monetary Union did not just turn up in this period — it was very long in the making, with a history extending right back to the founding fathers in the 1950s. It was at this point — and I’ve only reached page 15 — that I started suspecting that Rohac was taking the traditional Conservative eurosceptic narrative that the EU had somehow become corrupted and diverted away from its original noble and Hayekian course; of being very market-based but then getting delusions of political grandeur. The history of the European project shows that this is far from being the case and on this point I thoroughly recommend “The Great Deception” by Christopher Booker and Richard North. As I’m also a critic of traditional eurosceptic thinking (yet still a Leaver), Rohac thus embarks on a narrative, much of which I can agree with. Well, mostly. But because of the pro-EU position Rohac has taken along with his roots in Eastern Europe, some facets of euroscepticism he describes are, to my mind, exaggerated. In particular the alleged “Putinism” of British Leavers and them being “infatuated” with the Russian leader. I’ve always found that to be a vanishingly small minority of Leavers, barely represented or even unrepresented at national level. But yes I acknowledge Nigel Farage’s clumsy moment on this subject — one of many, that say more about the character of Farage than any vein of anti-EU political thought. Indeed other small exaggerations pop up here and there in the book, sometimes not always immediately relevant to the core argument. For example, the suggestion that there are almost the same number of EU nationals in the UK as there are UK nationals in the EU. The reality is that there are much greater numbers of EU nationals in the UK. Then the suggestion that prior to 2008, “the scope and character of EU-level decision-making was so limited and had so little salience in the eyes of the public, that the democratic deficit was only an abstract, theoretical problem.” That seemed an extraordinary suggestion for those of us who have been involved in this debate for many years. However — and this comes back to the point about traditional euroscepticism being Rohac’s “baseline” — his suggestion is that Eurosceptics suffer from the nirvana fallacy in that they complain a lot but “without fully pondering the implications of the arrangement that would likely replace it.” That is stated just before a whole chapter entitled “Meet the Discontents” covering some of the weird characters and opinions held by some within the eurosceptic constellation, mostly within UKIP. Again it all builds a picture of “traditional euroscepticism” as being the only alternative to being pro-EU, and a somewhat incoherent one at that. The book continues in that vein — of holding up traditional euroscepticism to the light and finding some of its arguments a bit limp and alternatives that don’t exist or don’t wholly stand up. On that we agree. But the author consequently also takes on some traditional pro-EU criticisms of that form of euroscepticism and elaborates on them — criticisms of the status of Norway, for example. And no mention of the ongoing globalisation process and its effects on the EU. Rohac also views euroscepticism as wanting the EU to totally break apart into its constituent sovereign nations. While Nigel Farage may shout about wanting to free all of Europe from the EU, many of us do not really see it in those terms (although we can see the contradictions in the EU construction that would lead one to think that way). In the end, what other countries want is a matter for them. We can only fully judge that it is an unsuitable arrangement for Britain. And yet as a former EU critic, one constantly senses that Rohac is aware of the bear traps in the pro-EU argument and so he walks along a very narrow ledge between legitimate criticism of the project and trying to push for an EU that is not like the EU of today. In this quest, I think he trips up on a number of occasions. The particular reference to the “Martin Feldstein conundrum” illustrates this well. Feldstein, an American economist, was highly critical during the 1990s of the push towards a single euro currency, believing that the wish to unite Europe this way would in fact do the complete opposite and sow the seeds of division and even conflict. Startlingly, Feldstein even wrote of “the risk of war”. And this would happen, according to Feldstein, because of the necessary one-size-fits-all policies: a uniform exchange rate and monetary policy across very different economies that are not otherwise form a single ‘nation-like’ polity; what economists might call an “optimal currency area”. In other words, political union by any other name. That’s not solving the conundrum for those countries; that’s making a specific choice to go the whole hog towards “a country called Europe”. Later, in the concluding chapter, he tries to temper this, but the choice he has made is clear. As I say, it isn’t for me to say that this is wrong for those countries. I merely note the example as an illustration of where Rohac trips off his narrow ledge and into full pro-EU political union territory. One should not be surprised, I guess. The book is, after all, subtitled “A Conservative Case for the EU”. 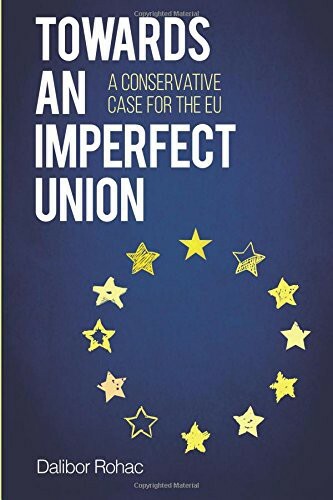 The more general and more important point that I think is glossed over in the book is that euroscepticism has partly arisen because the EU has gone too far ahead with integration. That point doesn’t really come out from the book and in true pro-EU fashion, Rohac sees the solution as a matter of working further with the existing EU design in order to get it right. Of course if one believes that the EU went off course around 1990 thanks to hubris, then one will also believe that such a redesign “back to original (Hayekian) principles” is possible. But as already noted, that is not how the euro framework in the Maastricht Treaty came about. The EU/EEC has always been on a road to political union through a process of ever closer union. Denying that is a never-ending myth of the UK Conservative Party needing to explain to itself, in revisionist fashion, why it was “the party of Europe” up to about 1988. So in the final analysis, it would be tempting to say that I don’t see anything very new in this book, but Rohac’s Eastern Europe perspective is an interesting one, although rather spoiled by the appeals to Hayek’s authority that don’t really work, and an impression that UK euroscepticism is littered with Putinists (which it isn’t). Further, Rohac moots a more Hayekian and overtly free market structure for the EU — “Europe will require a much larger dose of free enterprise medicine”. He does not however explain how some countries, preeminently France, are going to find it within themselves to accept such an “Anglo-Saxon” approach. Then, having mooted a more aggressively free market structure and outlook, Rohac proposes a beefed up European Parliament to address the democratic deficit. In my view, however, this is where the book meets the occasional collision between a “constitution for liberty” and democracy — a collision that libertarian-minded folk sometimes grapple with. While logical and laudable within the specific context, the Rohac approach risks creating an EU parliament with sufficient powers that will then undermine his classical liberal structure, succumbing to the usual interest groups, political ‘draws’ and ultimately to a pan-European ‘national’ chauvinism. In short, Mises would trump Hayek, and the book thus inadvertantly demonstrates that the whole EU concept is too littered with conundrums that if it went too far into the political realm, it would meet serious problems (as we have seen). Put another way, it cannot safely go beyond a mere market ‘commitment device’, unless of course a particular set of countries have the overwhelming political will to do just that. However it seems unfair to end this review of a fellow classical liberal’s work on such a critical note. What Rohac does acknowledge throughout his conclusion is the need for evolution not revolution. On that we certainly agree, although my evolutionary process is towards that ‘mere’ market commitment device. What the book also shows is that there is relatively little space between myself and Rohac, and yet we are on different sides of the pro/anti-EU debate. I am also critical of key parts of “Euroscepticism 1.0” (as I’d call it) and believe we need much more of “Euroscepticism 2.0”, which is currently a minority position. We are thus both walking on that narrow ledge between people who support the EU mostly as it is, and traditional eurosceptics with their aversion to all EU matters including the single market and anything else with an EU flag on it. What I think — and perhaps what I’m bound to say — is that Rohac needs a little more imagination in navigating a way through this, as well as a need to recognise the effect of globalisation on the whole debate… but not by giving the EU a bigger European voice on the world stage as he briefly proposes. As a lady once said, “No, No, No”. In particular, he needs to start considering Britain moving to a Norway-style position (which he agrees would be a relatively low risk manoeuvre) as the first step in a journey out rather than a destination. And also that such a radical move in political terms , but not economic terms, would itself set other dynamics in motion, drawing other EU countries back to that position. The most likely candidates are Sweden and Denmark. What this therefore comes down to is how those Europe-wide single market-based arrangements, upon which we may agree, can be designed, or — given the EU’s inability to change — forced. With the evident failure of Cameron’s EU reform (under threat of Brexit) and the ever-present danger of being drawn into the penumbra of an unstoppable Mises-style political union, it falls to Britain to call a halt before matters really degenerate and the fires of recalcitrant nationalism are stoked beyond control. I do not see how Britain can possibly do that inside the EU after Cameron’s renegotiation failure….or indeed especially because of Cameron’s renegotiation failure. I can only see it happening by Britain exiting to a single market-only position and setting in motion a new path and a new set of dynamics that would allow all EEA-only countries and non-euro countries to come together in that reconstituted position, while allowing the eurozone to go off and integrate as it sees fit. Plus shaping a structure enabling those two groups to continue engaging in a refined single market that has more checks and balances, with market management/enforcement decoupled from both groups. And in my view, the only way to force that is by voting to Leave. One might even call it a Hayekian manoeuvre.